New York, NY – The new Broadway production of Hello, Dolly! starring Bette Midler has just, in its third week of preview performances, shattered the house record for the highest weekly gross of any show in the history of the Sam S. Shubert Theatre. (The Shubert Theatre was built in 1913.) The record-breaking gross of $1,965,673.00 was achieved in just seven performances over the week ending Sunday, April 2. The previous record, of $1,902,189.44, was set by Matilda over the 9-performance week ending January 1, 2017. This production of Michael Stewart and Jerry Herman’s masterpiece, Hello, Dolly!, has quickly become the hottest ticket of the year, having previously broken the records for the best first day of ticket sales and the largest pre-performance advance sale in Broadway history. Directed by four-time Tony Award® winner Jerry Zaks and choreographed by Tony Award winner Warren Carlyle, Hello, Dolly! began performances at Broadway’s Shubert Theatre on March 15, 2017, and will officially open on April 20, 2017. 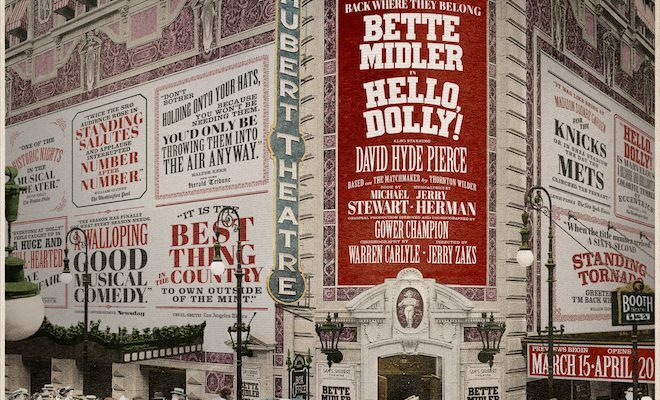 This Hello, Dolly!, the first new production of this classic musical (based on Thornton Wilder’s The Matchmaker) to appear on Broadway since it opened more than fifty years ago, will pay tribute to the original work of legendary director/ choreographer Gower Champion, which has been hailed both then and now as one of the greatest stagings in musical theater history.